UNINOVO Sealing & Packing Co.,ltd. is a leading company in the sealing industry in China for more than a decade. We have sophisticated manufacture expertise and advanced technologies and facilities. As a company certified with the ISO 9000/2000, we are behind the quality of our product. We have built the great creditability in the sealing industry. Our UNINOVO series sealing products are selling well in more than 27 countries and regions, including US, Canada, Germany, UK, France and Japan. We offer our customers with best quality, very competitive price and excellent services. 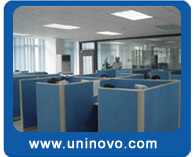 The UNINOVO headquarter is located in Shanghai, the economy hub of China. We own two factories in Cixi, Zhejiang Province. Our motto is "Innovation, Quality, and Honesty". Welcome to visit our headquarter and factories. Non-asbestos sheet, PTFE sheet, Graphite sheet, Rubber sheet, Cork Rubber, Mica sheet, Beater sheet, Asbestos sheet and so on.